Trials start today for the first group of January 20 (J20) inauguration protest arrestees. Most of the 192 remaining defendants continue to face riot, conspiracy, and property destruction charges equaling up to 60 years in prison. On November 13, the seven defendants in the December 11 trial block had their charges reduced by the prosecutor to misdemeanor engaging in a riot, conspiracy, and property destruction. These defendants now face less than two years in prison. Victories have been relatively small, but meaningful. In recent developments, on November 9, the DC superior court ruled that Facebook would not be required to provide the government with the identifies of all people who visited the J20 and related pages, unless the government could later show need related to particular persons. On November 1 the DC superior court dismissed felony riot engagement and conspiracy charges against all defendants and pressed the prosecution regarding the conspiracy charges. But misdemeanor engagement and conspiracy, and all other felony charges remain (except as noted for the D11 trial block). On October 22, the Department of Justice (DOJ) revised its request for internet records of all visitors to protest support site disruptj20.org and dropped its gag order preventing Facebook from disclosing search warrants to its targets. Also in October, disclosures from FOIA requests filed with the District revealed that MPD deployed weapons at least 191 times during the Inauguration and that DC spent $300,000 on weapons, ammunition and other military equipment for the protests. During the Inauguration protests, the Metropolitan Police Department (MPD) “kettled” hundreds of demonstrators, bystanders, journalists, medics and legal observers. They tear gassed and fired “non-lethal” weapons at the crowd, held them outside for hours without water or bathroom access and then unlawfully dragnet arrested them. In February, 214 of the 234 arrested were indicted. In April, the court returned a superseding indictment, charging felony incitement, engagement and conspiracy to riot along with five felony property destruction counts, and for some, felony and misdemeanor assault on an officer. 192 people still face charges, after 19 others entered guilty pleas (18 misdemeanors, with one felony plea, sentenced to four months in prison). Prosecutors claimed to have evidence showing that each defendant had “willfully incited or urged others to engage in the riot.” However, despite surveillance of meetings, cell phones, computer searches and social media, they have not provided evidence sufficient to support their claims. Citing heavy caseloads, prosecutors even tried to shirk their constitutional duties to provide incriminating evidence against each individual, attempting to prove guilt en masse. Following the dismissal of all felony riot engagement and conspiracy charges, the remaining charges are misdemeanor engagement and conspiracy, felony riot incitement, and felony property destruction. At an October 27 hearing the court also pressed prosecutors for a theory of the conspiracy case – when it started, how they will prove it, and why hearsay statements would be admitted. The prosecutor’s November 13 dropping of all felony charges against the seven arrestees scheduled for trial on December 11 leaves them facing three misdemeanor charges. DC legal experts say that while new misdemeanor charges could be added at any time through the end of trial, felony charges could only now be brought after indictment by a new grand jury or with a defendant’s consent. Experts have also suggested that the dismissals may be based on a reluctance to bring such protest-related cases before a jury. The November 9 ruling on the Facebook warrant applied to the host of the J20 page and two organizers, and sought the identities of all who connected with the pages. The decision required disclosure of the visitors’ communications, but the redaction of their identities, unless later granted by the judge on an individual basis after a showing of relevance by the government. Legal experts found the decision inconsistent with the court’s finding that prosecutors had failed to show probable cause to search visitors’ communications. On October 22, the DOJ revised its overbroad search warrant that had sought “logs showing connections related to the website, and any other transactional information, including records of session times and duration” on each of 1.3 million visitors to disruptj20.org. The warrant’s existence was revealed that same week when web company DreamHost announced it had received it back in July. As directed by the court, DreamHost will provide the records with personal user information redacted. The prosecution will examine the information and send a list to the judge for review in camera. If the judge agrees, those records will be provided to the prosecution unredacted. In September, DOJ dropped a gag order preventing Facebook from notifying targets about warrants, after Facebook’s appeal. Legal critics agree that the narrowed warrants continue to be constitutional violations. The use of kettle arrests is not new to DC. In 2002, then-assistant police chief Peter Newsham ordered the mass arrest of over 400 people during World Bank protests. In 2010 and 2015 the District settled multimillion dollar class action suits over their practices. Yet at the Inauguration, Newsham, then interim chief and now chief, redeployed the tactic. 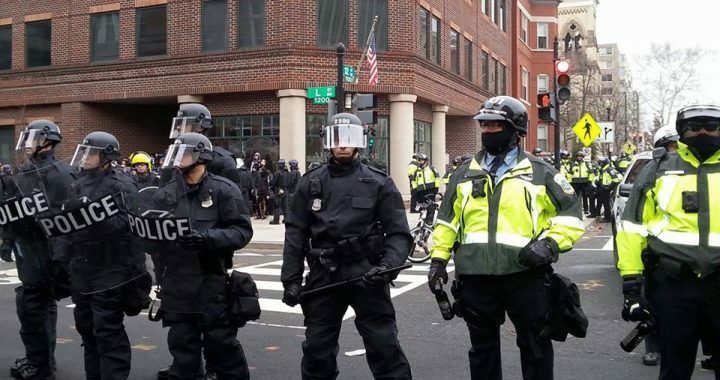 A February report by the DC Office of Police Complaints found that the MPD violated DC’s First Amendment Rights and Policy Act during J20 when it fired large numbers of “less-than-lethal” weapons against the crowds without warning or cause. Meanwhile, the resistance is ongoing. Defendant groups, activists, and criminal defense lawyers, including the NLG DC Chapter, have been working on behalf of the defendants’ support. More than 130 of the defendants continue to abide by their statement of unity, including: non-cooperation against codefendants, refusal to accept justification for the charges or actions of law enforcement, information and strategy sharing, and support for individual defendants’ principled decisions. Allies continue to provide support, including legal defense funds in a dozen cities. In October they held a “drop the charges” call-in campaign in support of a petition drive to the new US attorney Jessie Liu (as they had for her predecessor) and other DOJ officials and a Thunderclap campaign that ended today. Legal advocates continue criminal defense support and representation and are following up on the responses to their Inauguration FOIA requests. The scenario playing out in DC likely represents the future of both police tactics and protest prosecutions. In September, St. Louis police kettled and mass arrested protesters and bystanders following the acquittal of police officer Jason Stockley in the shooting death of Anthony Lamar Smith. Activists reported not having seen the tactic there before. In May, Attorney General Jeff Sessions issued a memo ordering federal prosecutors across the country to give maximum charges to defendants. In at least 18 states legislators have introduced bills to increase penalties for non-violent protest tactics. Meanwhile, in DC and elsewhere, the resistance continues to right wing policies and attacks on dissent. As former slave and abolitionist Frederick Douglass said, the price will be eternal vigilance. Read today’s analysis by DC NLG on this unprecedented prosecution and donate to the J20 Legal Defense Fund. Posted in NLG Blog and tagged DC NLG, Donald Trump, J20, NSSEs, Police, protests.